Roughly 3,400 people around the world die every day from traffic crashes. In most of the Low and Middle Income Countries (LMIC), more people die in traffic crashes annually than from violent crimes. While the location and circumstance of the traffic fatalities differ, between one-third and one-half of them have something in common: speed. Humans can only stand so much force from crash impact, and much of this is determined by vehicle speed. In the city of Mumbai, 91 percent of total crash fatalities are attributed to excessive speeding. In the United States, more than 9,200 crash fatalities a year are due to speeding. 1. Set a safe speed limit. Achieving safe speeds starts with safe speed limits. The surprising reality is that only 47 countries currently have suitable laws on urban speeds, representing 13 percent of the global population. The speed limit should be set and enforced based on the type of road, the quality of the road infrastructure and the safety level of the local vehicle fleet. This can happen at the national, state or local level, or at all three. The World Health Organization (WHO) recommends speed limits of 30 kmph (19 mph) on urban streets with high volumes of pedestrians, cyclists or motorcyclists, and up to 50 kmph (31 mph) on urban arterials with fewer pedestrians. Seemingly small differences in speed really matter. There is a 10 percent potential for death if a pedestrian is hit by a speeding vehicle at 30 kmph (18.64 mph), which doubles to 20 percent at 35 kmph (22mph). 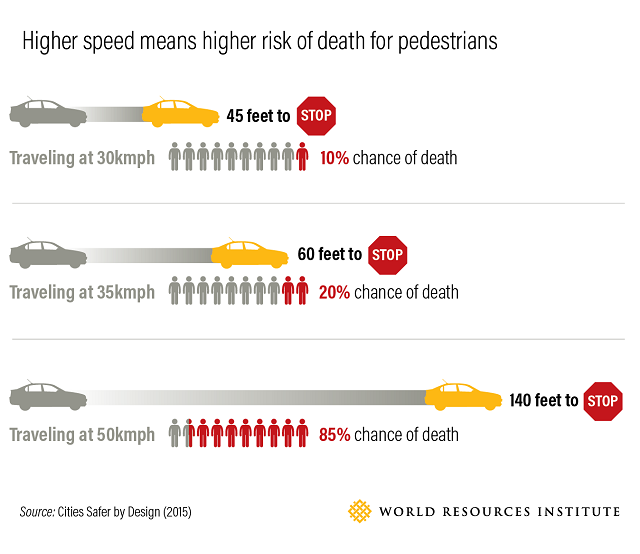 At 50 kmph (31 mph), the likelihood of death is more than 80 percent. 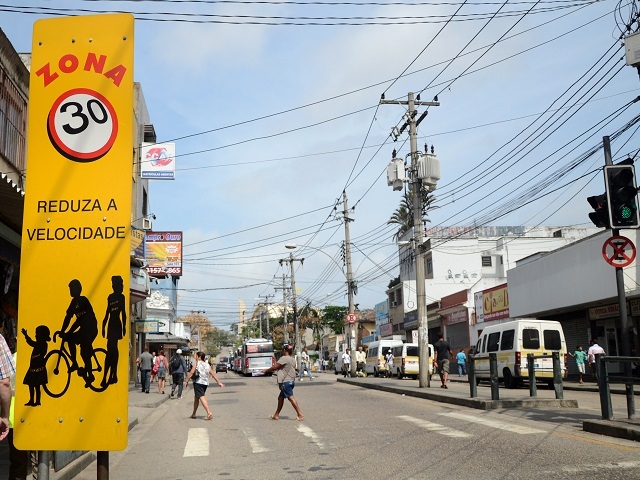 In the first month of reduced speed limits on two major arterials in São Paulo in 2015, fatal crashes fell by 29 percent from the year before. 2. Promote and enforce the speed limit. In many places, even if speed limits do exist, they may not be enforced by authorities or known and followed by drivers. Technology like speed cameras can help. For instance, Washington, D.C. saw a 60 to 80 percent reduction in speed violations within four to six months of camera deployment. During the same period, the city experienced a 70 percent reduction in traffic fatalities. Whatever the means of enforcement, cities should adopt a low tolerance for speeding. In many cities, speeding drivers are not given tickets until they are 10 kmph (6 mph) or even 16 kmph (10 mph) over the speed limit. But an increase of only 10 kmph can be the difference between life and death. 3. Design streets for their speed limits. A driver’s choice of travel speed is influenced by the characteristics of the road, so street design is critically important. Narrow lanes are proven to reduce speeds, along with resulting in more attentive driving. Partial lane-narrowing designs, known as chicanes and chokers, help to slow down vehicles midblock. They also reduce the distance a pedestrian has to travel to cross a road. Chicanes can reduce crashes with injuries by 54 percent, while chokers help to reduce speeds by up to 14 percent. Speed humps and speed cushions can reduce crashes with injuries by 50 percent. Raised crossings also require cars to slow down, and help to improve the driver’s awareness of pedestrians. Evidence from Latin American cities shows that raised crossings result in a 10 percent reduction in midblock speeds. 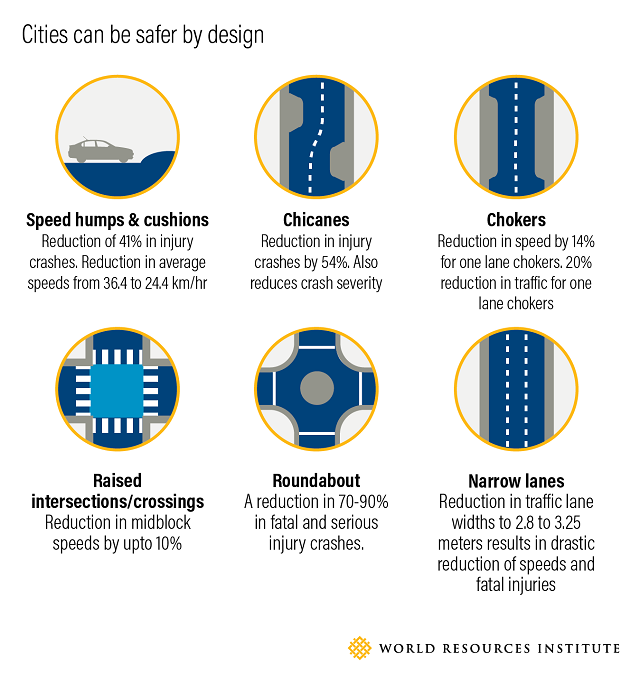 Details on these and other evidence-based measures can be found in WRI’s Cities Safer by Design report. 4. Get communities on board. Most people aren’t aware of how speed affects their safety and well-being, or that these issues can be addressed. Print, broadcast and online media campaigns help build awareness. However, the most effective means of getting attention and changing public perception takes direct engagement, imagination, and local flavor. In New York, the “That’s Why It’s 30” campaign featured advertisements making fun of New Yorkers’ tendency to “know everything,” while speed-activated signs displayed a digital skeleton to speeding drivers. Like a growing number of cities, New York has also had great success with tactical urbanism – making temporary changes to an intersection, street or neighborhood to allow citizens to experience the benefits of better street design and slower speeds for themselves. In many cases, such temporary interventions wind up becoming so popular that they are made permanent, such as the iconic Broadway redesign. These measures are so effective that the WHO is encouraging Slow Down Days for Global Road Safety Week this week. As communities experience the benefits of lower speeds, they will begin to demand them, as has been seen in London. Starting in the 2000s, the city introduced small 20 mph zones to improve safety in some neighborhoods. This intervention reduced fatalities by 23 percent within the zones, and by 3 percent in adjacent areas. The benefits were so well received that by 2016, 9 out of 13 inner-London boroughs had adopted 20 mph limits. As awareness of the benefits of safer speeds gains momentum, the demand for decision makers to design safer and more enjoyable streets will continue to grow.